In the course of developing CENTUM CS3000 R3 Revision 3.04, we also developed a new FFCS field control station which has achieved compact size and high reliability. The processor cards, being compact yet high performance, utilize field-proven "Pair & Spare" technology deployed in large-scale control systems, resulting in the implementation of sophisticated control functions and high reliability equivalent to the existing controllers designed for large-scale control systems. The FFCS is designed to be the same overall size as the existing "uXL" control unit, which enables easy replacement of the control unit without any changes. Moreover, CPU nodes, processor modules, ESB coupler modules, and V- net coupler modules have been newly developed for the FFCS. Especially, SEN bus (Serial Exchange Nest bus), which is a high-speed serial bus designed to suit the program copy and data equalization between dual redundant processor modules, has been developed as a new technology for data communication. Yokogawa Electric has been using Pair & Spare method as a reliability-enhancing technology for its line of distributed control systems (DCS) since the release of the CENTUM CS in 1993. As a result, the system has achieved an availability factor of seven 9's (99.99999%) for the record of operation to date. Under the basic concept "continually adopt new functions with assured function continuity", the CENTUM CS3000 R3 is being constantly improved through ongoing development and by introducing the latest technologies. Also strictly adhering to this basic stance for CENTUM CS R3 Revision 3.04, we have developed the FFCS compact field control station (Figure 1), which provides both the advanced control functions and high reliability levels required for DCSs, for use with small- to medium-scale systems. This article introduces the FFCS. Figure 2 shows the configuration of the CENTUM CS R3 system. 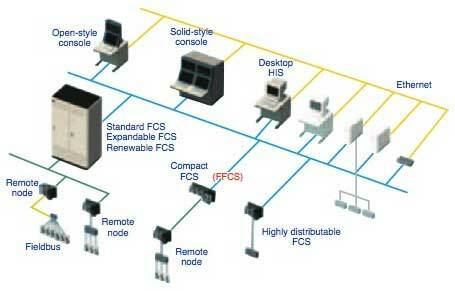 As for field control stations (FCS) to be connected to field devices to control the plant, we have added the small-size FCS (compact type, hereinafter called FFCS) featuring both high mountability and high distributability to the existing line of FCSs — standard, expandable and renewable FCSs that realize high mountability, and the highly distributable FCS that is suited for distributed topologies, according to the application capacity and the purpose of use. Figure 3 illustrates the external views of the conventional field control unit (FCU) and the field control unit (CPU node) of the FFCS and the features of the FFCS are described below. Positive adoption of the latest technologies has made the FFCS as compact as only one-fifth the volume of the conventional control unit. 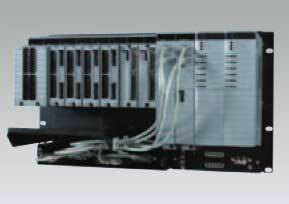 The number of I/O nodes can be increased up to three. Thus the system can be expanded without increasing the number of CPU nodes. The processor module employs Pair & Spare method, which is field-proven for controllers for large-scale systems, to switch the control right in case of system failure without any momentary shutdowns, thus minimizing the influence inflicted upon the process. While being compact, the module has the same advanced control functions and highly reliable architecture as those of controllers for large-scale systems. In addition, the processor module can be made completely dual- redundant. The external dimensions of the FFCS are the same as those of the control unit section of an existing uXL control system for small- to medium-scale plants. It is therefore possible to migrate to the FFCS by simply replacing the control unit section with the station. This feature enables the user to reuse its existing assets to the maximum possible degree and update the existing system with the minimum investment in the plant and equipment. As shown in the dual-redundant configuration diagram of Figure 4, the processor module, power unit, communication bus, and I/O module of the FFCS can all be duplexed. 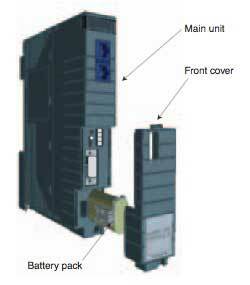 The I/O module (IOM) and the field network I/O module (FIO) of CENTUM CS R3 have been made common to each other. This section focuses on the hardware of the newly developed CPU node. A maximum of eight IOMs can be installed in the CPU node, allowing the CPU node to operate alone as the minimum system of the FFCS. A maximum of three extension nodes (direct-coupling and remote nodes) can be connected to the CPU node. When connecting the CPU node and direct-coupling node, an ESB bus coupler module (EC401) is installed in the IOM section of the CPU node and an ESB bus slave interface module (SB401) is installed in the extension node. When using the remote node in place of the extension node, an ER bus master interface module (EB401) is installed in the IOM section of the CPU node or direct- coupling node. Figure 5 shows the dual-redundant configuration of the processor modules. The dual-redundant processor modules employ the field-proven Pair & Spare method. Each processor module comprises two MPUs, where the MPUs perform the same control computations and the computation results are cross- checked by the collators to detect transient errors. With the dual redundancy of processor modules, the transfer of the control right in case of system failure and the continuation of control are accomplished without any momentary shutdown, achieving high degrees of system availability. Figure 6 shows the external view of the processor module. The module has been changed in shape from the conventional card-like form to a modular form in which the internal assembly is encapsulated in a molded housing. For the internal hardware configuration, we reused the hardware assets, i.e., the processor card (CP345) and SB bus interface card (SB301) of the industry- proven CENTUM CS3000, and incorporated them into a single module, while maintaining the software compatibility as much as possible. Equipped with the microprocessor which is field-proven as has been used for the industry-proven CP345 processor card, the processor module makes it possible to build scalable systems by using the same system software for small- to medium-scale plants and large-scale plants as well. In order to mount the CP345 and SB301 on a single module (i.e., to achieve downsizing), we actively adopted a programmable device in a fine-pitched multi-pin ball grid array (BGA) as a large- scale integration component, chip capacitors and resistors of 1005 size as small-size components, and new elemental technologies, including build-up boards for densely mounting such components. The processor module contains a battery pack in order to back up the main memory in case of power failure. However, taking environmental protection into consideration, the conventional nickel-cadmium batteries have been abandoned and replaced with nickel-hydrogen batteries. 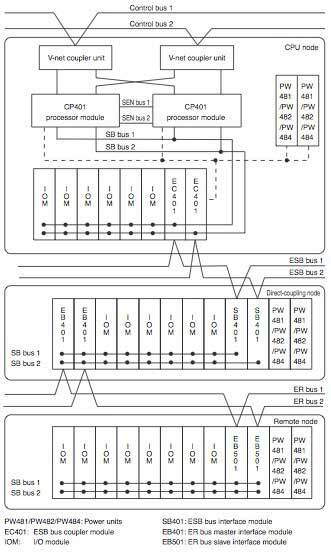 We have also developed the SEN bus for program copying and data equalization between the processor modules. Table 1 shows the specifications of the SEN bus in brief. Traditionally, data exchange between the processor modules has been performed using a parallel transmission method. In the case of the SEN bus however, the method has been replaced with the point-to-point high-speed serial transmission method to reduce the mounting area and the number of signal lines to one- tenth those of the conventional bus. Since the LVDS (EIA/TIA- 644 standard) method featuring small signal amplitudes has been adopted for the bus signal levels, radiation noise has been reduced and power consumption has also been dramatically reduced. From the point of view of high reliability, we added an error- detecting code and made it possible to connect/disconnect the module with the line electrified. The SEN bus is provided with error-detecting functions, such as constantly performing self- diagnoses using idle frames even in the absence of bus access requests. 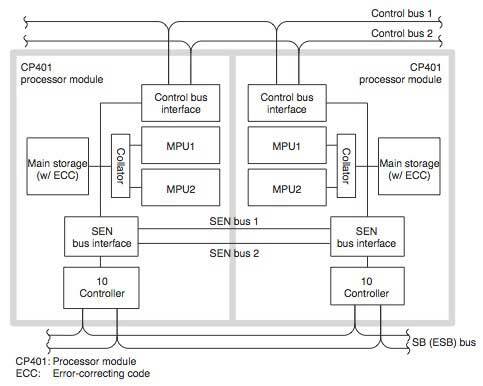 From a software point of view, the SEN bus inherits exactly the same interface as that of the existing backplane bus. Thus the FFCS features a design in which users need not be conscious of the SEN bus. We have also developed the ESB bus coupler module (EC401) designed to connect the direct-coupling node to the CPU node. The module has one port for the ESB bus to communicate with the ESB bus interface module (SB401). 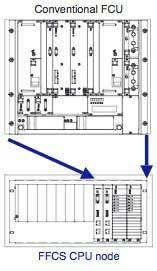 By installing two units of the module, it is possible to support for the dual redundancy of the ESB bus. The FFCS employs the field-proven V-net as the control bus. The V-net coupler unit is equipped with a V-net data link control section and physical layer interface to provide signal isolation and level conversion for the V-net. Yokogawa Electric's DCSs have evolved through the positive adoption of new technologies in line with market requirements (performance, functionality, and capacity increase). We have increased the capacity and functionality of FCSs' control units in harmony with improvements in semiconductor integration technology and enhancements in microprocessor performance. Since the amount of data for equalization between the dual- redundant processors has increased significantly, the conventional transfer capacity will no longer suffice. We have retrofitted the backplane bus which has not been changed since the release of the CENTUM CS. In addition, we have developed the SEN bus (high-speed serial bus) for data equalization between the dual-redundant processor modules of the FFCS. The technical progress of the SEN bus holds promise for the bus to become even faster in future. Consequently, it will become possible to further enhance the functionality and performance of FCSs. CENTUM and uXL are registered trademarks of Yokogawa Electric Corporation. The names of companies and products that appear in this document are the trademarks or registered trademarks of the respective holders.